that i will be packing with all kinds of nice thingies. I am organising this Giveaway! 1. What Etsy item from my last post do you like the most and why? 2. What item do you like least and why? 3. What kind of item are you missing and think would be great to also sell in the coming Etsy shop? 4. Do you have any other tips, comments or anything considering the Etsy adventure? Let one thing me very clear! I will NOT base the winner of this giveaway on the answers you are going to give. Those are only for my information, because i find it important to know your opinions about the things i made and want to sell on Etsy. I will use that thing 'Oh hello friend' always uses for her giveaway's, that's called 'The True Random Number Generator' from random.org to decide who's the winner. So everything will be completely honest! Now you want to know what's to win, right? 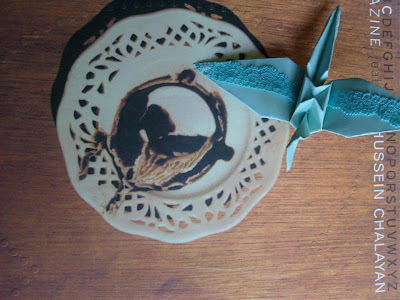 - A lacey paper crane or something with a lacey paper crane. - A mobile / garland. - A set of 2 hairclips i will be decorating myself. - A set of nice paper, images etc. because surprises are always better! and when the winner received the stuff, i will be posting the items that were in it. here some pictures from this amazing Flickr Group called Nice Package! But I love it so much! it will be new things, i yet have to make! The 'style' of the stuff, will be like what you saw in the last post, of course. Coming Monday i will be going to London until Thursday, so you can comment and take part until next weekend (July 4th&5th). Then i will 'close' this and post the winner of the giveaway. Soon after that i will be sending the package to the winner. Of course i don't know exactly when it will arrive, that's depending on the country you're living in. Please leave your emailaddress in your comment, so i can contact you if you are the winner! Happy commenting and thanks so much in advance! What a beautiful idea! Hope to be the lucky one!! I like the paper cranes mobile best. Especially the one with the tree branch, simply because I love mobiles and I love the mix of different texture/materials. I love everything you showed in your last post. this is a really hard question. Maybe the tags? Simply because I do not use tags usually...but if I had one of yours I would find a use for it that's for sure! I am not missing anything. Usually I just like things that make me smile and that reflect a certain kind of love from the creator. I like things that surprise me and reassure me. Promote. Promote. Promote. that's my main problem with mine. (Also I got caught up in too much things beside my Etsy store...). I love everything you've shown and whether I am the winner or not I can't wait to see pictures of all the little things you will make. 1) De kraanvogels zijn m'n favorieten, 'k vind ze echt enorm elegant en dat stukje kant maakt het helemaal 'af'. 3) Hmmm, ik weet niet of je goed kan naaien? Rokjes of strikjes voor in't haar, of misschien juwelen? 4) Ik kan je geen advies of tips geven, maar wel heel veel succes wensen! Die verpakkingen en inpakpapiertjes die je hier hebt gepost zijn ook zooo mooi. Ik vind het echt jammer dat er in onze maatschappij nog zo weinig echte brieven worden geschreven, er is echt niets fijner als de brievenbus opendoen en een dikke envelop met je naam op te vinden! 1.I love the paper cranes the most I think ^^ I love the lace on the wings, it makes them unique! 2.Oh I can't say that because I love all of it! Honestly! 4. Hmm, I've bought lots of stuff on Etsy but I've never sold anything so I don't really have any tips xD I don't think you will need them either because your store is going to be awesome either way. 1. What Etsy item from my last post do you like the most and why? i just adore the cranes with lace on the wings. so beautiful. 2. What item do you like least and why? i can't pick out a single thing, darling. i actually would be overjoyed to have any of them in my possession. it was hard enough picking a favorite. ANS: This is really hard to choose, you know. Ok, I'd have to choose the paper crane mobiles. I love the pastel colors and the lace detailing. I already know where I'm going to hang it if I win. ANS: I'm going to answer this based on what I need and right now, I have plenty of clutches. So given the choice, that would be the on this list. ANS: I'm looking for a good vintage-inspired brooch. gosh, I hope I win!! I was instantly drawn to your paper collages. I love how you have them on a garland, too. Honestly, I looked through your post several times. I even went nuts trying to FIND your etsy shop when I saw the post and then realized, you didn't have one yet. ;) I really can't say that I don't like any of your artwork. I LOVE your art, your taste, your style and the lovely items you pick out! YOUR artwork. YOUR taste. YOUR vintage pickings. I've been selling on etsy for a couple of years now. I've been buying on etsy, too. I LOVE etsy. Promote. Links on your blogs, websites, etc... Give great descriptions. Excellent photographs. Fair shipping. Be yourself. Be honest. I wish you the best of luck in your venture! Do let us know when you start to sell! What a lovely idea, I want to open up an esty with sweet little things myself! By the way, I think your blog is fantastic. I can't wait for you esty to open. I'm floored by how much thoughtfulness your putting in. 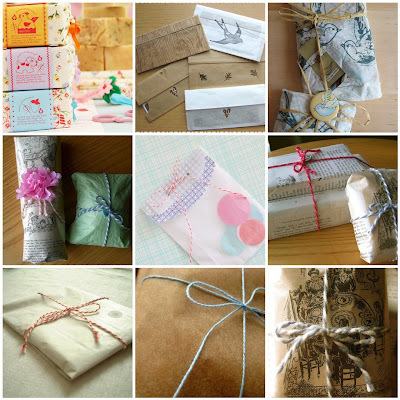 It will be a real treat for somebody to open something that's neat and cute, wrapped real pretty. Care certainly adds so much to the experience. Ans: Crane mobiles~ their darling. Of course, I've seen crane mobiles, but yours are unique with their lace and such. I think that makes then all the more delicate and beautiful. They're certainly whimsical and I find them very inspiring- if I don't buy one for myself I'll definitely set out to make one. Ans: Garlands- there darling, but I have a few similar danglies and I find them kind of boring. Ans: I'm always looking for bracelets. I often necklaces and earrings dominate esty. Some handmade bracelets with beads and vintage charms and such would be a gorgeous addition. Best of luck with your store. Best of luck to everyone entering. And to everyone, have a nice day. Oh and thanks for hosting a giveaway, I love darling free things! It's so nice of you to do a giveaway, you make such beautiful things. 1.My favorite thing was the journal. I dream of being a writer one day so I love to doodle. And it seems like it would make a perfect inspiration notebook. 2.I hate to choose a least favorite because everything was so beautiful, but it would have to be the vintage stuff. I'm such a klutz & I would be scared to break it. 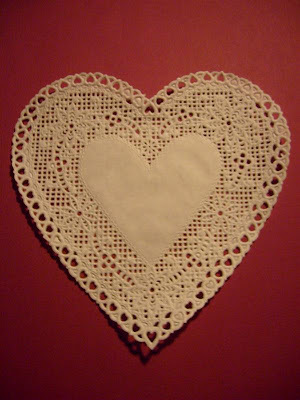 3.I would like to see some nice hand towels with your decorations and lace on them. 4.You've come up with so many perfect ideas. My advice would definitely advise you to do your shop because the world would really appreciate your designs. 2.i don't honestly least like anything! it's all beautiful! 3. i would love to see mini collections with lots and lots of random things from all over that we can choose what goes into it. that would be could. 4. when selling on etsy, taking great pictures is key! i feel really insecure about my pictures sometimes. 1. I love your collages, paper cranes, and garlands. They would be so amazing hanging above a bed. 2. Nothing! Everything is absolutely cosmic!!! 3. I remember that you used to take gorgeous Polaroids....I would happily buy some of your prints. The cranes. I've always loved cranes and I love what you've done with them. Maybe the notebook. It's made beautifully but it's not my style. Very much a personal thing. I'm sure some original paintings would be great! 1. That's easy, the custom notebooks, having something so pretty to write in would be a good motivator to write more. 2. The breakable items, only b/c I am always scared they will break in shipping! Oh Soooo wish I can get this delightful, beautiful package!! ! I ignore 99.9% of giveaways but this one really gets my attention and confidence. I like the "Paper Crane Mobiles" the most because the bird itself represent hope and love to me, and the layer of lace makes it elegant and unique. I like Stationery and sweet clutches the least, because the shade of pink is too sharp for me. 3. What kind of item are you missing and think would be great to also sell in the coming Etsy shop? I think your designs will be so great for antique jewelry box! With pieces of this and that. Photo album would be great too! Your designs reminds me of beautiful memories. I often shop on etsy, it's a very artisty place, I think it's important to love what you make and love your customers, have a more personal relationship with them, reply emails quickly and oftenly updated. awww.. what a great post! giveaway from you would be fantasic! all the beautifully-detailed little things! 2. the tags perhaps? i am not sure about the prints. it's my own thing anyway. 3. a bottle with all the lovely decorations on! I sincerely hope to see a bright future in your Etsy. 1) I enjoy your mobiles because they remind me Japan, soft things, sky, freedom... very beautiful ! 2) I think that I like least the tags, maybe because I'm a boy... and they are very "feminine" ! 3) I enjoy lovely notebooks such as Moleskine where I can write all the things I want, so lovely notebooks would be appreciable, cool, and welcome ! 4) I think that you are very creative and I'm happy to see that persons still do such things with their own hands! Congratulations. I hope it will work, I hope you will create a lot of beautiful things, objetcs, papers, etc. There is nothing I dislike, I think the item I would be least likely to buy would be the collages, because I have nowhere to put them! Keep going with the style you have, it's very pretty and recognizable. And of course, good luck! I wanted to send you an email, but can't see an address anywhere, I don't want you to think I am leaving this comment just so I can win something, so please don't put me in the draw. I have been following your blog long before I started commenting almost from when you started. You are like an art curator, each post filled with beautiful and inspiring things, it takes takes talent, and flair and creativity to put together posts like you do, not just anyone can do that. Every time I vist your blog I go away feeling inspired and the fact that it has done so well is testimony of your talent. Now you have translated your eye for beauty and your creativity into making your own things and they are absolutely lovely, something special, and the more you do of it the better you will get. I wish you would realize what an amazing and talented person you are, it just shines through in your blog. 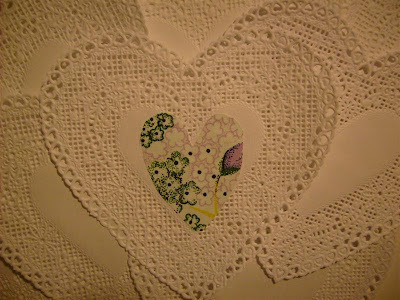 And I wish you everything of the best in your etsy endeavour, I know you will do brilliatly!!! 2. What item do you like least and why? Though I do like the name, Garlands of tears, because I worry they may not sell as greatly as the others. They are made with the prettiest of fabrics, but I guess it just doesn't appeal to me the most. 4. Do you have any other tips, comments or anything considering the Etsy adventure? Have fun, don't stress!! The lace cranes. They are very unique and pretty. I was not feeling the decorated journals, but I feel that was because they just were not my sort of thing. Jewerly perhaps. I also feel that you should just make what you want to and are good at or it not fun anymore. Promote and have fun with it. oooooooohhhh!! I hope im not too late, i love packages. What Etsy item from my last post do you like the most and why? What item do you like least and why? Polaroid pictures, i love polaroid pictures, im always collecting them. ohhh this is so exciting!!! nothing would thrill me more than to get a package from you filled with beautiful things! I didn't really like the collages because (and maybe it was just a bad photograph) they seems kind of amateur looking and I don't know what i would do with the collages. i think you should do illustrations (but i have no idea if you're a good drawer or not-i bet you are) but i'd love to have hannah muller-esque illustrations. congrats and best wishes on your etsy endeavors! thanks again for having this giveaway! haha..dont be sorry for not visiting...there was nothing to visit. i took a two-month hiatus. and btw, you said you're still awaiting your answer. umm...sorry but what are you talking about? Hello Mila. How lovely to see what you have been up to behind the scenes of Loveology. I think it's a fantastic idea to start an etsy shop. I loved the cards that you made. I think the collages would be really great as wrapping paper prints and also for the cards. So that way it's not limited to just our own walls. I think all the ideas are great, but I'm not sure how easy it would be to post the paper cranes. I think your vintage finds are great. I think you have lovely taste in fashion so I would love to see you share that! I can't think of anything else at the moment, except, oh wait.. have you thought about making limited editing zines? 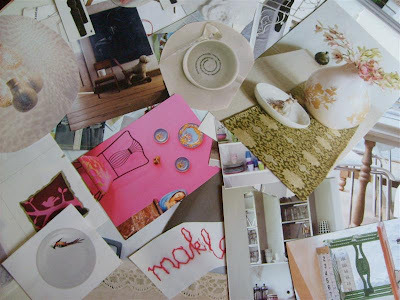 Like loveology zines where you use your collages etc? Hope my suggestions help. Good luck with all that. I'm listening to Michael Jackson at the moment. It's so sad! my favourite item was the "sweet little tags". i think they are very adorable, and versatile! it looks like you can put it on anything and add a nice little touch; the thing you put it on doesn't even have to match the design of the tag! my least favourite is probably the "paperworks". you did a good job designing and adding to the photos, but the paperworks just don't fit my style. perhaps some clips, like paper clips or those binder clips. decorated, of course. thanks forposting this great giveaway opportunity! hope you make somebody's day! 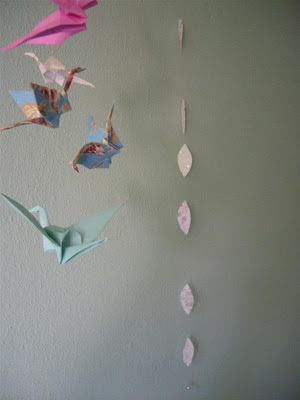 I would say out of your handmade this I loved the paper crane mobiles the most. Their unique and I believe they would give some's room alot of character. I'm not sure, but have you ever tried making lace roses before? I just learned and it's alot of fun and they could make a lovely pair of earrings or you could adoren your clutches with them. Give it a try! OH! I've heard it said by other sellers(I read alot of interviews there) that the etsy forums are great for adice and encouragements. Advertising too I believe. Also, the treasury section. It's my favvourite place. Perhaps one day your cranes will make it there. I know I'd love to add it to one of mine! 1. You have made so many lovely things here, but my favorite is the purple crane mobile! I love the bold color and the pretty prisms! 2. I don't like this question Mila! If I must say something, I'd say the blue/turquise paper crane is my least favorite. I'm not to excited about that color. Pretty crane though! 3. There are so many things you could make,hmm..Perhaps other origami figures as well, in addition to the birds? 4. 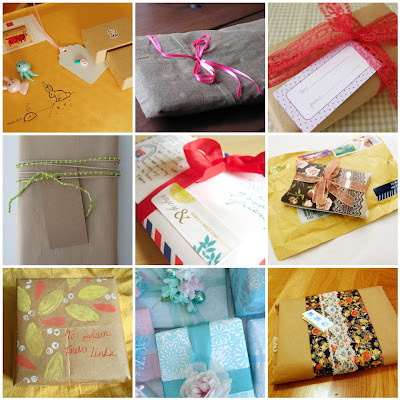 Other tips....I always appreciate beautifully wrapped and decorated packages, but I can see you already have thought of that yourself..
You have inspired me to sell my things on etsy as well...Can everyone join or do I need an invite? I'm so glad someone else has read Shadow In The Wind! It's one of my favorites! And thanks for the tip about this giveaway I want to win sooooooooo badly. Unfortunately I always have bad luck with these types of things I hope the fates bend in my favor this time. 3. I love collecting doodles that people make for me and framing them on my wall. you should make some simple little drawings in your style for people to frame. maybe even just on found pieces of paper or something fun like that? 4. good luck! I'm a big supporter and you know I'll be promoting you on my blog when the time comes for your new shop to open! Wow Mila, your very own etsy shop, how exciting and it’s so obvious that it will be a labor of love which will only add to it’s success! Well, I hope that’s helpful and I hope you are well dear! All the best with the opening of your shop! I do hope I win your giveaway, haha, I would be overjoyed!!! By the way, thanks for your sweet comment too… always love to hear from you my dear! Oh I can't choose! Maybe the journals... but I also love the paper cranes! I would love to see what vintage items you will sell (that aren't your own). And if you do make homemade clothes, I would buy them! You are a true gem, and I can't wait to see everything you create. I love your work, and am VERY excited for you, Mila!! 1. I wanted to say the stationary notebooks because I am a sucker for stationary! I love books and tags and all soprts of gorgeous things! But..... THEN I looked back through and noticed the cute little crafty kits. I think they are adorable! and I looove getting a mix of stuff! 2. I like them all really, but I have to chose so I'd say the garlands of tears. I don't think there is anything wrong with them (they're adorable) but I like everything else just a little more! 3. This is a good question! ermmmmmmm.. and a really tricky one! I've got to say I love envelopes so maybe along with the stationary type things, you could make some gorgeous envelopes with all sorts of different materials, tracing paper, old magazine clippings, even fabric.. ooh but that would be more like a purse. Or maybe you could make purses that look like envelopes? that'd be cute! whoops i just realised question 4 was about the selling more than the buying! doh silly me! Hi sweetheart, here i am! 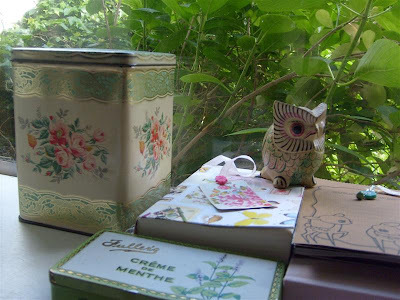 A: the notebook and inspiration collage board, and those so very lovely vintage stuffs. I think anything you made (handmade) is perfect. I want to buy your polaroids in particular. Well...I can't wait to see you etsy shop. 1. Ik vind je customised notebooks erg mooi. Maar ook the paper crane mobiles. Vooral met kant. 2. Moeilijk, eerlijk gezegd geen één. Echt niet! 3. Zelfgemaakte of vintage sieraden. Wellicht ook kleding??? 4. Mooie foto's maken, maar dat lijkt me voor jouw geen probleem. Ook reclame maken op andere blogs, die iets over jouw te etsy winkel posten. Bijvoorbeeld als ze iets gekocht hebben. **Do what feels good for you. I read that you sometimes feel insecure about the things you make, but the fact that you put effort and love in it, means that it is special! :) "
Ahh who can pass up the possibilty of surprise mail!! 2. oh man-tricky!! I might have to say the little box of hair accessories, but only because i think i would be a little apprehensive to buy that sort of stuff online, otherwise everything is too cute! 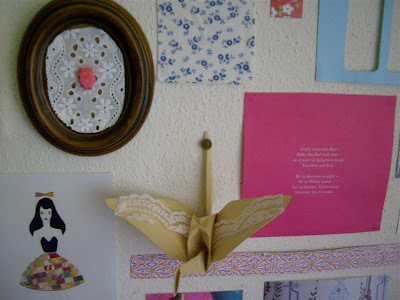 i love the sweet paper cranes and the inspiration line. i think everything you posted is adorable! i'm interested to see what others say here as i am considering a shop as well. :)good luck! Paper crane mobile because it makes me happy and I could find room for it anywhere in my house. Stationary, but only because I have so many boxes of stationary that I never use. They taunt me, but I'm an email girl all the way. Coasters! Kinda off-the-wall, but I would love some soft, feminine, handcrafted coasters. Everything I find is tacky, bright, and/or logo-ed. I've never done anything like that before, so all I can say is kudos and good luck! 'Garlands of tears' - they are both SOO lovely! 2. Honestly, i hope it's okay to say this, there really wasn't anything I did not like! everything was so cool and i really like the concept between the part vintage/part handmade. 3. Some art pieces? You have such amazing design style. 4. Just take GOOD pictures and provide good information ;) the pictures really sell the product. and of course, PLEASE feel free to email me with any questions you have! Hope you're having a great trip in London! Thanks for a lovely giveaway! Oh my goodness, you're opening an etsy shop? No way! That is beyond awesome. The cranes I think, the lace makes them so unique. Or perhaps the vintage stuff because I'm a little vintage obsessed. Hmm. I don't know! There's a picture of some hair grips, so I guess I'll say those because I'm lazy and I never do anything with my hair! Pillows, because I saw some of your pillows and fell in love! That little wooden owl is super adorable! Als je vanaf het malieveld het bos in gaat, neem dan na de eerste brug gelijk het eerste weggetje rechts.. Doorlopen (fietsen) langs het water, en een stukje voor de autoweg weer begint staat 'ie aan de overkant van het slootje in iemands tuin! I love everything in your last post. Maybe 'Garlands of tears', because these are the simplyest and plainest things.Although they do look good. I'm not missing anything. I love your creation they are so feminin. I adore your blog . that wooden owl! I have the exact one at home, it's just a dark wood tone with varnish and no paint. My mum gave it to me and my grandma gave it to her, I'd love to know where it came from. Do you know the origin of yours? 1. favorite item: ...i have two. (hehe). the solid colored cranes w/ lace lining- ex: the turquoise one. (see #3 answer for what i'd use them for!) & 2nd the bird in branch white cutout on brown paper- i would use this as a journaling gift for a friend. 2. least fave: maybe some of the tags? only because i don't have a purpose for each one yet... but i'm known to hold things as long as need be to find it's one true purpose. 3. what to add? : i would love some sort of crane/branch combo to be used in a tall vase for home decoring... if it's not efficient to provide the branches you could still totally make one yourself & use it as one of your etsy pics to help 'sell the idea'. best of luck... always love what you do & smile lots! I really liked the teardrop-ish garland. I love almost any garland, so that's why. Hm. Probably the cranes, but I don't dislike them, I just don't respond to paper cranes much. I don't believe I'm missing anything...the good thing about etsy is that people make what they are good at making, so you get the best stuff. I don't have an etsy, so I have no tips, but good luck! Wow, your paper cranes remind me of this novel I read cale d"Cathy's Book", and this man bewitched the papaer cranes to fly and deliver message, in the seqel. You seem v. gnerous to give away such beautiful creations.
. What Etsy item from my last post do you like the most and why? I love those paper cranes! Especially the ones with the lace. Very elegant and well made. Not that I hate it but I'm least interested in the garland simply because I will find no use for them. It would be great if you sold handmade jewelry, hair accessories like bows or headbands. Cute little notepads, sky is the limit! Come up with a great banner because I'm initially attracted to that when I see an Etsy store. Your pictures should be of high quality, not too busy. Let the beauty of your creations shine through. This is really a great way to promote your upcoming Etsy shop! I wish you all the success and luck! I LOVE the paper crane mobiles! So pretty, and so many possibilities. I think these would sell well on etsy. I love the paper cranes. The lace on them looks lovely. Probably the collages. I'm not a big fan of fashion cut outs. Don't expect it to take off straight away. It takes some time to get 'noticed' - forums, other marketing (eg Facebook) and lots of relisting which can be costly. 1. Absolutely the paper crane mobile. I've been wanting to make one for a while, but just moved to Guatemala and can't seem to find really great paper. 2. I love everything equally. 3. Since my arrival here in Guate, I have become obsessed with the Quetzal bird. It is so pretty with a long colorful tail and I would love to have some sort of artwork with a quetzal. 4. I can't really comment much on an Etsy shop as I don't have one myself, but I do think that having great photos is essential. I just found your blog from oh, hello friend's link. It's so sweet of you to have this amazing giveaway! I'm thinking about starting an etsy shop, too, and have been racking my brain for good ideas. I'll have to copy you and have a post on my blog! 1. The mobile! Especially the second one. Oh my, that is lovely! It makes me wish I had a little girl so I could hang it above her crib! The vintage items are really sweet, too! 3. Other papercrafts like your cranes would be great! Origami, maybe cut paper, stationary or cards using that talent. 4. Well, having yet to start an etsy shop, I don't really have any advice to give, but good luck! I love your site -makes me so happy and inspired! 2. Couldn't say there's anything I don't like. I see that you've got an illustration by Caitlin Quiet there! I love her work, and just ordered my first one.. can't wait to receive it.